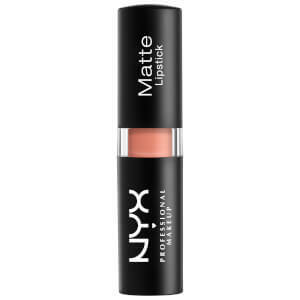 Create a statement lip with NYX Professional Makeup Liquid Suede Matte Metallic Lipstick, a matte liquid lipstick that delivers highly pigmented colour with long-wearing, high-metallic results. Inspired by the brand's best-selling Liquid Suede Cream Lipstick, the liquid lipstick is creamy and comfortable despite its matte finish, and glides effortlessly on, delivering rich, opaque colour that leaves lips looking polished and perfected. Infused with Avocado Oil and Vitamin E, the lip colour is non-drying and will add striking vibrancy to your everyday makeup look. Apply to the lips from the centre outwards for a flawless pout.